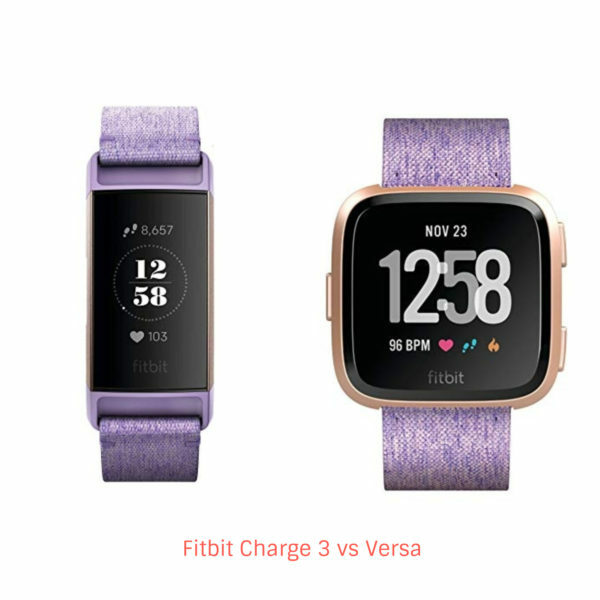 Which Is Better, Fitbit Charge 3 vs Versa? Heart rate monitor	 Fitbit Versa also tracks the heart rate 24 x 7 thanks to the PurePulse technology. It also tracks other activities. Fitbit Charge 3 has a PurePulse technology that tracks the heart rate 24 x 7 and also tracks other activities. Automatic sport recognition	 The Fitbit Versa has an automatic sport recognition mode. It features a SmartTrack technology to record and recognize workouts in the app. The Fitbit Versa has an automatic sport recognition mode. It features a SmartTrack technology to record and recognize workouts in the app. ALARMS	 It vibrates when the set alarm goes off. It vibrates when the set alarm goes off. WATER RESISTANCE	 Versa is also water resistant and swim-proof up to 50 meters. It also tracks the swimming activity. Charge 3 is water resistant and swim-proof up to 50 meters. It tracks the swimming activity. FLOORS CLIMBED	 Versa also keeps a tab on the floors climbed. Fitbit Charge 3 also records the floors climbed. CALLER ID & MESSAGES	 Versa also displays caller ID and messages and also allows the users to reply to the text and accept or reject calls. Fitbit charge 3 is capable of displaying caller ID and messages and also allows the users to reply to the text and calls. It also permits the user to reject calls. REMINDER TO MOVE	 It also has a reminder to move mode. The user can adjust this mode according to the need and time. It has a reminder to move feature that can be set according to the user’s choice. DESIGN & SCREEN	 The Versa has a larger and clearer display with a broad screen as compared to charge 3. It is heavier. It has a sleek and stylish design. Charge 3 is lighter as compared to the Versa. DISPLAY	 Versa has a larger LED touchscreen display as compared to the charge 3 having a display size is 1.34 inches. Charge 3 has a large OLED display. It has a touchscreen. The display size is 0.72 inches. SLEEP TRACKING	 Versa also tracks the sleep stages and how much time you spent in REM, deep, and light sleep. The Fitbit Charge 3 tracks your sleep Stages. Peach/Rose	 Grey/silver, peach/rose, black, lavender woven, and charcoal woven are the colors available. PHONE-FREE MUSIC	 Versa offer phone-free music option. Charge 3 doesn’t offer phone-free music option. The first and most important feature that is similar in the Fitbit Charge 3 and Versa is the heart rate tracking. Both fitness trackers have the ability to monitor continuous heart rate 24 x 7. As we have already discussed above in the Fitbit Charge 3 vs Versa comparison, both fitness trackers have the ability to keep a tab on your continuous heart rate as well as measure the resting heart rate, which makes both trackers ideal for the fitness enthusiasts who would like to see the accurate heart rate. Both heart rate trackers monitor continuous heart rate because of the PurePulse technology. This technology detects the pulse rate to monitor heart rate. In terms of heart rate tracking, both heart rate trackers are best for measuring accurate heart rate. Another feature that makes the two watches similar is the activity tracking capabilities. Now that you know both fitness trackers inform you about the heart rate and the level of intensity you need to do the workouts. The Fitbit Charge 3 and Versa keeps a tab on all day activities, including steps, distance, active minutes, calories burned, floors climbed, and sleep tracking. If you connect them with GPS, then you can get the real-time stats. Both fitness trackers have the ability to keep a tab on your sleep stages, which means how well you have slept and how much time you spent on what sleep stages. The watches keep working even when you are asleep. It monitors how long you spent on light, deep, and REM sleep. It improves the quality of your sleep and both watches also wake you up with a silent alarm when you have slept enough that is required for your health. Apart from tracking all-day activities, Charge 3 and Versa also records your swimming activity. We all know that swimming needs some extra effort and it is a kind of exercise itself and if you want to keep a tab on swimming activity, then both fitness trackers are good. Versa and Charge 3 are waterproof and swim-proof up to 50 meters. So, you can enjoy swimming with the watch on your wrist. Another feature that makes Fitbit Versa and Charge 3 watches similar is female health tracking. This feature allows you to track period and calculate ovulation. In short, you will get to see a detailed chart of your cycle and other useful information that you need to know about your health. Fitbit community support is always there to provide information and tips about your health and issues. Guided breathing session is another feature that is common in both fitness trackers. This session helps you calm your body and mind. It is a useful feature that regulates your breath, reduces the blood pressure, stress, and anxiety. 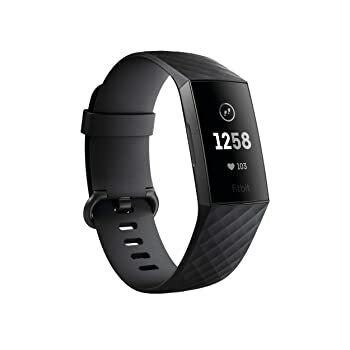 As you have observed from the above mentioned Fitbit Charge 3 vs Versa comparison and similarities between both, you can get a light idea that both fitness trackers are quite similar. But, that does not mean they do not have any difference. There are a few dissimilarities that make both fitness trackers different from one another. In terms of features, Fitbit Charge 3 and Fitbit Versa have lots of similar features. It is the time to know what makes both fitness trackers different from each other. Take a look at a few dissimilarities that makes them stand apart. The on-screen workout or coaching is one of the important features that assist you while exercising. This is the only features that correct all your moves. It’s like a personal assistant or a trainer is guiding you all the time you exercise. This will surely help you get in shape and stay fit. The Fitbit Versa has an on-screen workout feature, while the Charge 3 lacks it. Charge 3 and Versa has a touchscreen, which is definitely a similarity between both fitness trackers. But, Charge 3 has an OLED display, whereas Versa has an LED display. Plus, the screen size of both heart rate trackers is different. The screen size of Versa is 1.34 inches, while Charge 3 has a display size of 0.72 inches. Other than that, the weight of both fitness trackers is different as well. The Charge 3 has a weight of 29 grams, whereas the Versa weighs 38 grams. Another feature that makes the Charge 3 and Versa stands apart is the battery life. Charge 3 has a battery life of 7 days, which means you need to Charge it once and use it for 7 days. On the other hand, the battery life Fitbit Versa is 4 days. 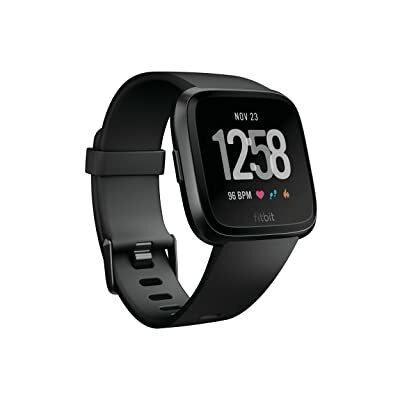 The Fitbit Versa allow you to access phone-free music, which is an important feature as there are a lot of fitness enthusiasts who need to listen to music at the time of working out. Music works as a source of motivation for many people. Versa allows you to store and control 300+ music without needing to operate it with the phone. Now that you have gone through the Fitbit Charge 3 vs Versa comparison and similarities and dissimilarities between both, you have got the slightest idea of what features you need and what you don’t. Coming to Fitbit Charge 3 vs Versa and which one is better, I would like to sum up that most of the features of both watches are similar except for a few. If you are a music lover and need to listen to your favorite music while working out, then Fitbit Versa is definitely the right choice. But, the battery life of Charge 3 is better than Versa and to be honest, the battery life is really important as you need to wear the watch all the time. The Versa has another feature that Charge 3 does not have and it’s the on-screen coaching. If battery life is important for you, then pick Charge 3, otherwise, for some extra features, you can choose Versa. Fitbit Versa vs Blaze – Which Heart Rate Tracker You Should Choose?